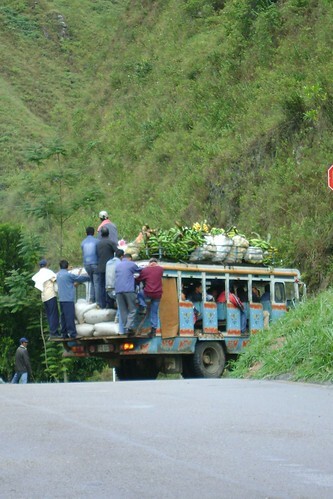 The traditional rural buses of Colombia are wooden-sized no-window affairs peculiar to Colombia called chivas. 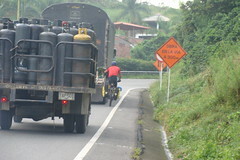 We see them all the time, packed to the gills with people and cargo. 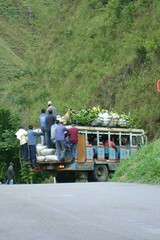 Normally there's a load of men hanging onto the back or riding on the roof with some extra cargo, too. We haven't taken one, and don't know if you get a discount for hanging onto the back that way. In Armenia, our WarmShowers host Gonzalo took us out for a day of mountain biking up to a beautiful colonial village named Salento. 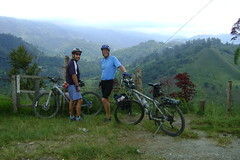 We had a great day,except for dragging our bikes down a horrendous muddy slot to the river below... If he takes you that way, make sure to go on the road instead. 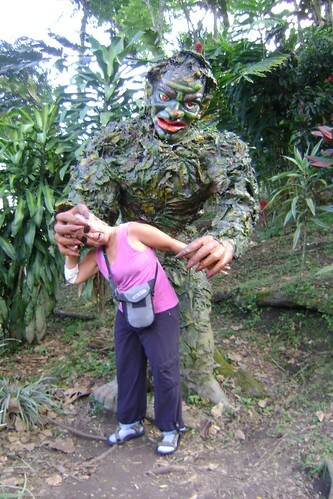 Nancy had a harrowing encounter with a goblin at the Parque Nacional del Cafe (National Park of Coffee). The park (actually a theme park with lots of educational exhibits about coffee growing and the whole process) was quite interesting and well done. Apparently they wanted a "National Park" devoted to the all-important national crop, and decided that they'd just make one. It was worth visiting, although we had our doubts. We spent the whole day there and understand coffee better now. And I got to ram Nancy a lot on the bumper cars. There are lots of pictures of the beautiful flowers and orchids in the park here. The great pride (and seeming astonishment) of all of Colombia is that the highways and much of the rest of the country are now secure. 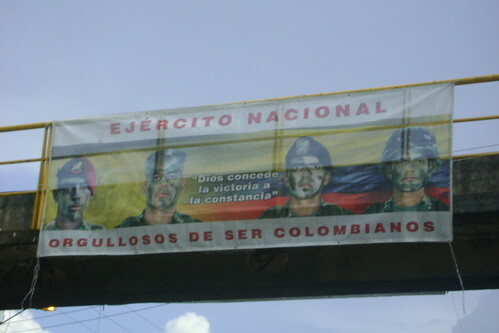 The president has convincingly secured much of the country by using the military everywhere. We see checkpoints every few miles, normally with some pretty bored young soldiers. The banner shown here is displayed many places, promoting the role of the army in cleaning up the former violence of the highways. Military service (or police service) is obligatory for 1 year for all young men, so it's a bit like Israel here. Lots of police. But there's more confidence here that things are on the upswing.